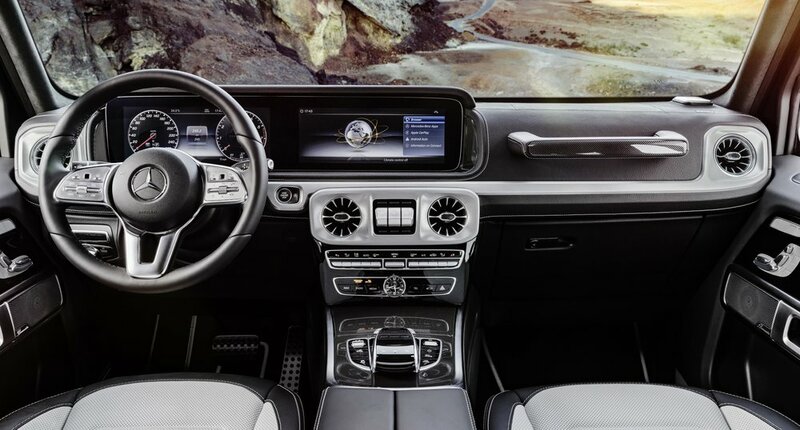 Yes, you read that correctly, Mercedes-Benz have given their G-Wagen a super exclusive interior that you can argue now justifies its price tag! It's an off-road legend, and since 1979 more than 300,000 examples of it have allowed their owners to experience adventures that would have been unachievable with any other vehicle, say Mercedes-Benz. G-Class drivers will soon be able to control the full infotainment system without taking their hands off the steering wheel. The touch-sensitive Touch Controls on the steering wheel respond to swiping motions in the same way as the surface of a smartphone. Thanks to haptic impulses (witchcraft) and additional feedback from the onboard speakers, the driver can use the touchpad without looking away from the road. The input options are rounded off by shortcut keys in front of the Controller for frequently accessed operating tasks, and by the optional control array for the driving assistance systems above the rotary light switch. The driver sits up close to the windscreen and enjoys good all-round visibility from behind the wheel. The very clearly laid-out and completely redesigned instrument panel features timeless tube-look analogue dials as standard. In other words, fans of classic round instruments will certainly not be disappointed in the new G-Class. The seats in the G-Class are equipped as standard with numerous convenience functions such as the Memory function for the driver's seat, seat heating front and rear, and luxury head restraints in the front. Such ride comfort can be enhanced still further if so required with the Active Multicontour Seat package. As well as the special multicontour seats, this encompasses such features as a range of massage functions, climatised seats and fast seat heating. This variant also offers electrically adjustable lumbar supports for the driver and front passenger. The side sections of the seat cushions and backrests of the active multicontour seats include integrated air chambers that fill or empty on a continuous basis according to the driving dynamics, so providing better support for the seating positions of driver and front passenger and, for example, offering more lateral support during cornering. The front seats of the Active Multicontour Seat package are recommended by experts from the German spinal health organisation "Aktion Gesunder Rücken e.V.". The storage space has been thoroughly overhauled, with numerous new storage areas ensuring that everything has a home. Under the armrest, for example, is an illuminated compartment for small items such as chewing gum, handkerchiefs or perhaps sunglasses. A wireless charging point here can be specified as an optional extra. In front of the touchpad in the centre console are two removable cup holders and an oddments tray. The rear doors are each capable of accommodating a 1-litre water bottle. The rear bench seat has a freestanding backrest, so allowing maximum variability and better visibility through the rear side windows. The new G-Class will be celebrating its premiere at the North American International Auto Show 2018 in Detroit.